Celliant®: How Does it Work? bloodflow and a balance in body temperature. The control subject on the left is not wearing Celliant. Since its inception in 2003, Hologenix, LLC has been working to improve this new technology and bring it to market. Celliant was initially developed in the 1990s by studying methods to improve natural healing in Asia and then subsequently developing those techniques so that they could be integrated into fibers that are used in clothes and other textiles. Hologenix developed a patent protected method for adding the minerals into the center of the fibers where they remain and provide benefits without affecting the quality of the yarn. 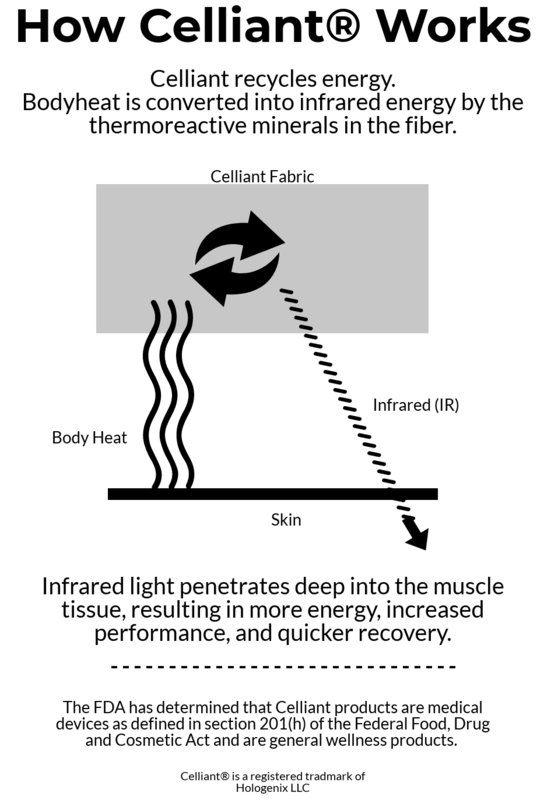 Celliant’s blend of proprietary ingredients reflect light (both visible and infrared) back to the body changing the wavelength of the light so that it is more easily absorbed by the body. The energy from this light improves blood flow in the target area. Celliant works by increasing the amount of blood traveling into the affected area, not by causing the blood to absorb more oxygen. The increased blood flow and blood oxygen levels help muscles and joints combat stiffness, soreness and edema caused by aging, injury or arthritis. Many satisfied users have described the effects of better oxygenation on the body. More recently, the beneficial effects of Celliant fabric materials have been measured in a series of clinical studies, first among diabetics, then among healthy subjects. This is important because technologies like hyperbaric oxygen chambers claim to improve oxygen levels by causing you to breathe-in air richer in oxygen, but typical blood cells are already 95-100% saturated with oxygen when they reach their destination.